Hardwearing and constructed from laser cut steel. Designed and manufactured in the UK, this quality product has the look and hardwearing finish that you would expect. The standard mount measures 150mm high to the top of the mount plate with a base measuring 95mm in diameter. 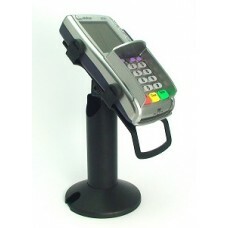 Made from steel with a durable, powder coated, matt black finish, this stand is specially designed for VeriFone VX810 credit card terminals. This stand can be screwed to the desk or fitted with an extra-strong adhesive base, providing security against theft. The design also helps to prevent accidental or deliberate tampering with your credit card terminal. Unit comes fully assembled with full fitting instructions and tools. If you have particular design requirements with regard to the height or colour of your desired stand please call the office to discuss your individual needs.